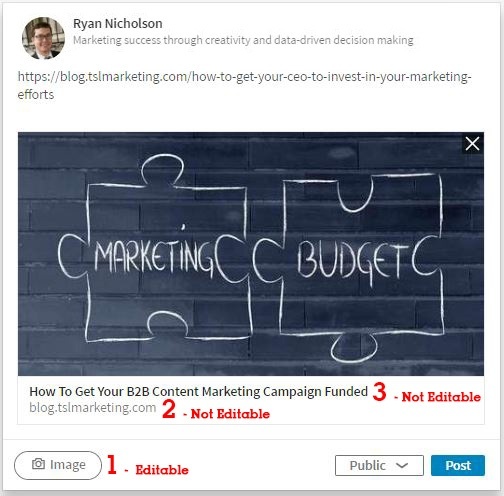 In this article we'll be discussing how LinkedIn users can amplify the reach of their company page content by sharing it out via their LinkedIn connection networks. Let's dive into the anatomy of the LinkedIn share. We've updated this article for the new company page layout that's being rolled out right now. Company page administrators now have a new interface which they'll use to make updates, edit the company page, view company page analytics, and see company page notifications. We'll use TSL Marketing's own LinkedIn company page in the examples below. If you don't already have this view you should be able to access the new admin experience via a link on a notification at the top of your company page. Want to Share Your Content Further and Faster? 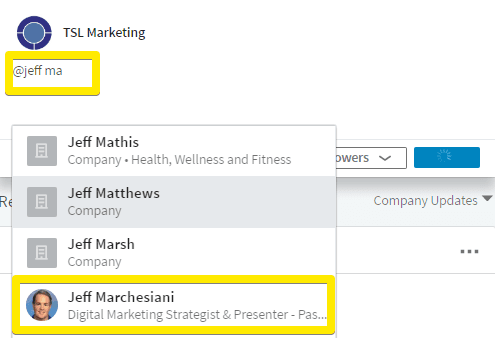 Posting a link to your LinkedIn Company page allows you to post an update out to all of your page followers. Page admins can do this via the new company pages "Admin Center" on the company page. If you aren't an admin you'll need to become one. You'll have to follow these steps to become an administrator of your LinkedIn Company page. If you aren't an admin then these options won't be visible to you. If you haven't already created a company page you can follow the steps here to get started: Create a LinkedIn Company Page. Read my next article for tips on how to create great content for LinkedIn. Page administrators will no longer create posts from the public company page view. Admins will now select to "manage page" in order to get to the admin center. When you create updates via the new company pages admin center you can make edits to the social media copy in the space directly under your company logo. You can also edit the image that renders. If an image doesn't render you can select a new one via the camera icon (see screenshot below). In the new version of the updates section, you can no longer update headline and meta-description. In fact, meta-descriptions no longer appear in the LinkedIn feed. Unlike @ mentions on personal profile posts, the person or persons mentioned on company page posts do not recieve notifications. To do this you just type the @ symbol and start typing a name or company name. Once you've got your copy ready and you've add in your link you can go ahead and hit the "Post" button. If you've not attached an image your post will look like the example below (Notice that Jeff is now mentioned in the post). You'll also notice that there are new image and link icons. Click the link for more information from LinkedIn about the new LinkedIn company page experience. 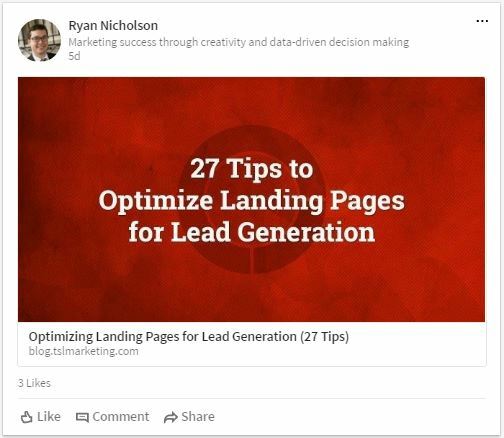 If you don't have very many page followers then the rest of this article will be useful in showing you how to amplify your company page content via personal LinkedIn updates. Don't try to go at this alone. Social media is best when your entire team participates in sharing and amplifying your content. Most importantly, unless your company page posts are liked and/or shared, then the only potential audience that your updates have are your company page followers. 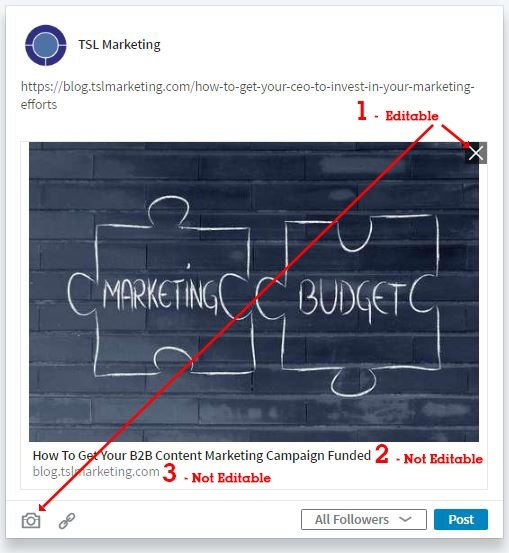 Unless you're considering LinkedIn Sponsored Updates, there is a limited amount of ways to expose the company page itself to a wider audience. Admins and company employees alike need to take part in this process in order to get your company pages messages to a wider audience than just your company page followers. Go to your LinkedIn feed--this is your home screen on LinkedIn. Find an update from your organization. Hit the like and/or the share buttons. A "like" shows your connections that you liked an update. You could consider this to be a very passive share. A share allows you to add in copy about the update that you're sharing. Publicly - with anyone on LinkedIn. Publicly and to your Twitter feed (if you have Twitter connected. To share only with your connections on LinkedIn--the post would not be viewable by anyone who you aren't connected with. You're also able to send the message directly to a specific selection of your connections. Update: Admins are now able to like, share, and comment directly from the company page feed. This is a change from the previous set up, where if an admin performed an action on the company page, they were acting as the company. Rather than searching through your feed for a company page post, it 's probably easier to ask your team to go straight to the company page to to help amplify your company page updates. 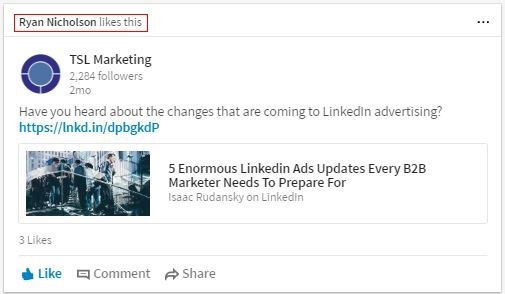 Once you find the page update you want to promote, then, just like in your LinkedIn feed you hit the like or the share button of the update which you'd like to share with your network. When you hit the "like" button, a notification will go out to your network that indicates that you liked the content. When you hit the share button you're able to share the update along with your own comment. We'll look at an example of this below. In order to show that this came from a specific company page, you'd need to @ mention the company page. Using the @ mention for a company page can help you gain company page followers because more people have the chance to see and click on the link to the company page. Step One: Find the content you want to share. 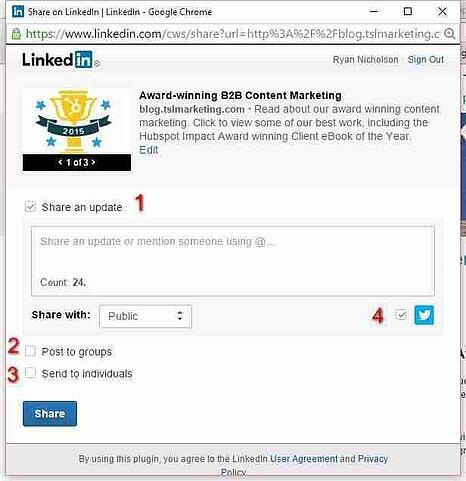 Step Two: Click on the LinkedIn Share button (you must be signed into LinkedIn). Share an update - Select this to share with your LinkedIn connections. Post to Groups - You can share the update with any groups that you are a member of. It helps to have some familiarity with the group and know what kind of material is posted there. Send to individuals - You can select from your connections and send to them by typing their names. When you do this the link will appear in their LinkedIn inbox. Share to Twitter - Checking off this box allows you to share to a connected Twitter account. 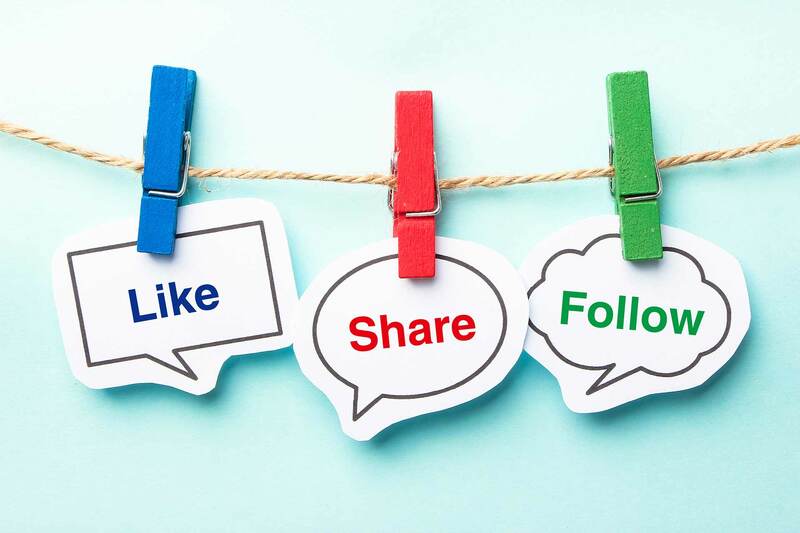 When you perform these actions you may also choose to add your own comments in the box labeled "share an update or mention someone using the @..." This gives you the opportunity to add your two cents about the post, or call specific attention to a person or a company by using the @ symbol. 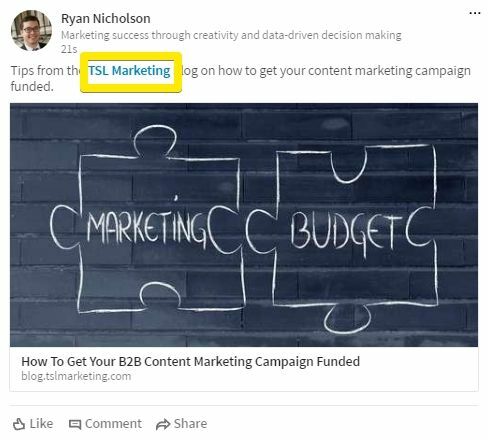 Like the examples above, when you type @TSL Marketing, it allows you to select TSL and creates a link in the update that will direct anyone who clicks on it to the TSL Marketing LinkedIn Company Page. When you share an update this way it may not always render perfectly. While you used to be able to make adjustments to the way the updates looked, individuals no longer can control for the image or headline that renders when they paste in a link. You are able to load your own image and link. When done in concert, liking and sharing a post can amplify your content out to a much wider audience. For example, let's say your company page only has 50 followers. Any post to that company page has a chance to be seen by those 50 followers, but in reality it may only get half that many impressions if no one interacts with the content--or none of your followers happen to be logged into LinkedIn. 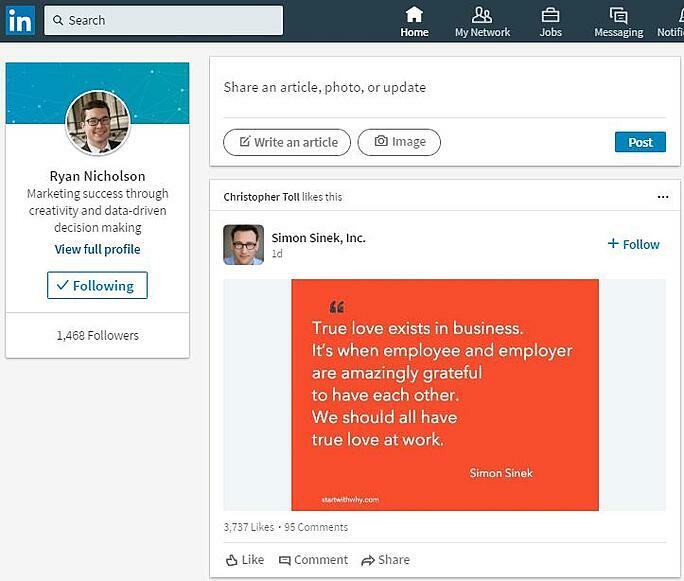 If two LinkedIn users with 250 connections each find the update and like and/or share the content then now you've magnified your potential reach by ten times. This means more potential impressions of your post and more clicks to view your content. 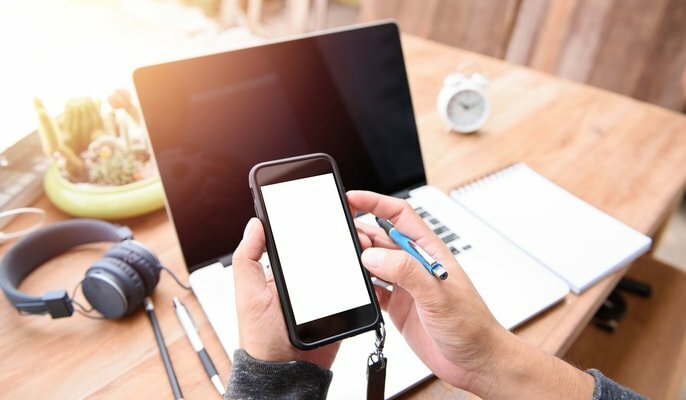 If you want to get the highest amount of impressions, clicks, and conversions, then it's critical that you get your most well-connected team members to like and share your content out to their LinkedIn social network. Not only do these actions help to grow the reach of the content, they can have the effect of making the content trend on LinkedIn. 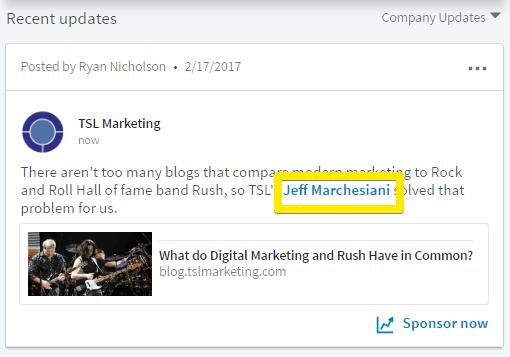 Update: We're watching to see if the "your network is talking about" function is still around in the new version of the LinkedIn feed. You and your team members have customers and prospects in common who may not be following your company page. When a LinkedIn update "trends" LinkedIn exposes this to people in those shared circles by lifting those posts up higher in their feed along with an announcement that says "your network is talking about..." Getting content to trend this way can expose it to even more people as this kind of content will be seen as a "Top Update" by the LinkedIn algorithm. Try to share early in the morning and middle of the week. LinkedIn has more traffic at this time. Add in commentary when you feel you can add insight to the post: ex "here is the newest blog article from the TSL team. An excellent primer on the basics of a LinkedIn Company page." Keep your commentary relatively succinct. When you "like" a post that is essentially an endorsement and people in your network will see you took that action. When you "share" this gives you the ability to add a comment or not, this comment is also seen by your network of connections. "Send to individuals" may be useful if you're looking for specific people to see the post, or if you're trying to send to your internal advocates to get them to see and share the post. There are some limitations here because it goes to their LinkedIn inbox. Depending on their settings they may never see this message if they don't check that inbox. When you perform this action you can give your email a subject and a message. "Share in groups" can help you spread the message to certain groups you're a member of but just make sure that the post isn't overly promotional. If it is you it may be rejected by the admin or moved to the promotions section. "Share in Groups" allows you to start a discussion around the topic. Once you select the group or groups you'd like to post the update to, it can be helpful to try to use the "title" and "detail" section to say something or start a conversation about the update. Title: "Tips for backing up your business data"
Detail: "Here are tips on how to protect your critical business data. What is your data loss horror story?" Remember that in order to share a post to a group discussion you must be a member of that group. By adding this commentary you're doing more than posting a link. You're trying to get people to engage with your content by doing more than just clicking and reading the link. When someone posts a comment on your discussion, then that post has the chance to get more impressions and potentially more engagement. Note on Images - You may add images to any update you post on the company page. Make sure that you have the rights to use that image. You can put your logo or any image elements from your website here. There are paid and free stock photo options as well. Images help your updates stand out in a sea of social media updates. Visit http://blog.tslmarketing.com for future articles in this series including information about the basics of using your LinkedIn company page, simple steps to optimize your personal profile, how and when to use LinkedIn advertising, and more. Bonus: 50 Ways to Get More LinkedIn Page Followers via Forbes.